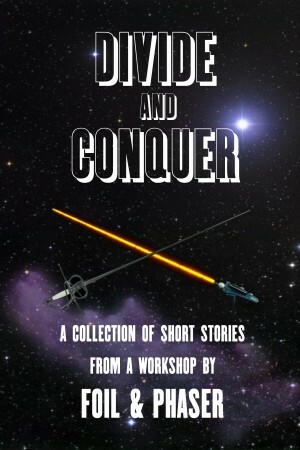 In early 2013, the Sword & Laser book club and podcast announced that they were taking submissions for a short story anthology. On the group’s Goodreads forums, a discussion began about what could be done with all the entries which wouldn’t make the cut. A community blog, where authors could submit their writing and have it read and critiqued by their peers, was suggested by me as a solution for some those stories that didn’t make the cut. The site, Foil & Phaser, is intended to be an opportunity for developing artists to hone their skills and network with other writers and readers. This collection of short stories is the product of a workshop where a group of authors collectively tried to complete the 2013 National Novel Writing Month challenge of writing 50,000 words in the month of November. The goal was to have the group submit their stories, and then they would peer edit to critique and offer suggestions to improve their writing. As a reward for their efforts, the finished stories were gathered into this volume to be published online. While ultimately we didn’t meet our goal of completing NaNoWriMo, we managed to get over 38,000 words down which is an accomplishment in itself. Foil & Phaser will continue to offer online writers workshops for beginning to intermediate skilled authors, so look for more of these volumes in the future.